Shenzhen, China, April 8, 2014 - QIMA, a leading provider of quality control services for businesses importing from Asia, Africa, Southern Europe and Latin America, today announces its 2014 Q1 Barometer, a quarterly synopsis on outsourced manufacturing and the quality control services industry. 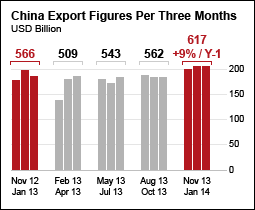 Due to Chinese New Year seasonality, February export figures plummeted 18% compared with 2013. The media has been reporting that the Chinese economy is on the brink of slowdown. What isn't mentioned is that China continues to be the dominant sourcing region by sheer volume. December and January set new records for total exports, surpassing $207 billion USD in both months.1 Adjusting for the Chinese New Year holiday by comparing November through January 2013/2014, total Chinese exports increased +9% compared with the same period in 2012/2013. QIMA figures surpassed this with year over year growth of +12% for ordered inspections within China. More telling and perhaps a leading indicator of the export figures to come, March was up +26.2% compared with the year before. Why the increase? In Q1 the Chinese Yuan had the first major currency reprieve since 2005, depreciating 2.7%. For companies looking to emerging markets for manufacturing, this has been little more than a "China-Plus-One" strategy: core manufacturing has remained in China. China has continued to preserve a healthy balance of wages, a developed infrastructure and the world's largest workforce. South & Southeast Asian countries have offered opportunities to reduce labor costs. Though their respective economies are much smaller, emerging markets were the clear winners in percentage growth. Ordered inspections in Bangladesh were up +70% year over year and Vietnam +57%. Cambodia increased +32% despite unrest in the apparel industry which has resulted in protests across the country, escalating in January when police fired upon protestors, killing at least four people and wounding 38 more.2 In Indonesia, where the textile industry is set to become the country's largest export segment, inspections were up +22%. There has been a growing awareness and demand from the consumer, not only for a high quality product, but a high quality supply chain. QIMA's 2014 Q1 data shows a +156% year-on-year increase in Ethical and Manufacturing Audits in Asia. Rana Plaza highlighted how factories often illegally sub contract out orders after major retailers reported that their products were never authorized to be manufactured there. An increasing common practice is to interweave Ethical Audit Programs with on-site product inspections to ensure manufacturing actually occurs at an approved factory. "There's notable traction taking hold in supply chains worldwide: corporations putting their money where their mouths are and governments moving forward on legislation", said Sebastien Breteau, CEO of QIMA. 1. Trading Economics. China Exports. April 2nd, 2014. 2. CNN. At least 3 dead after Cambodian security forces open fire on protesters. January 3, 2014. 3. The Sourcing Journal Online. New Study: Costs of Compliance in China Expected to Rise. April 2nd, 2014. 4. The Guardian. EU to force large companies to report on environmental and social impacts. April 2nd,2014. 5. China Daily. 16 dead, 5 injured in China factory fire. January 14th, 2014. 6. South China Morning Post. 11 dead, six injured in Guangdong factory blaze. March 27th, 2014. 7. Just Style. Analysis: Is Africa the next frontier in apparel sourcing?. April 2nd, 2014. 8. Just Style. Ethiopia a rising star for sourcing garments. March 6th, 2014.